Zion Market Research has published a new report titled “Medical Holography Market by Product Type (Holographic Displays, Holography Microscopes, Holographic Prints, Holoscopes, and Holography Software), by Application (Medical Imaging, Medical Education, and Biomedical Research), and by End-User (Academic Medical Centers, Hospitals and Clinics, Research Laboratories, and Pharmaceutical and Biotechnology Companies): Global Industry Perspective, Comprehensive Analysis, and Forecast, 2018–2025”. 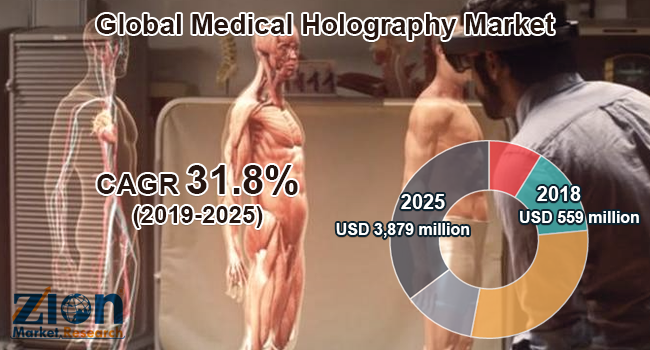 According to the report, the global medical holography market was valued at approximately USD 559 million in 2018 and is expected to generate around USD 3,879 million by 2025, at a CAGR of around 31.8% between 2019 and 2025. Holography is the science of creating holograms that are typically proposed for exhibiting 3D images. Holograms are physical structures that divert light to form an image, which is known as a holographic image. This image can be seen by shining a laser via a hologram into an illuminated holographic print. Holography was invented by Gabor in 1947. The global medical holography market is primarily driven by the rising adoption of holography products for medical education and biomedical research. In the medical education community, imaging of the brain is problematic, due to the complex 3D arrangements of the human body. The conceptualization of 3D images inside the human brain is a challenging task that needs extensive use of the brain's working memory. Holography allows the users with full parallax, auto-stereoscopic three-dimensional images, which are useful in several medical studies and biomedical research, which is anticipated to further fuel this market’s growth over the estimated timeline. The global medical holography Market is segmented on the basis of product type, application, and end-user. By product type, the medical holography market is segmented into holographic displays, holography microscopes, holographic prints, holoscopes, and holography software. Holography microscopes are expected to register the highest growth rate over the forecast time period, owing to the increasing clinical and microbiology research activities. By technology, the medical holography market includes medical imaging, medical education, and biomedical research. The biomedical research segment held a significant market share in 2016 and is expected to register the highest CAGR over the forecast time period. This can be attributed to growing biomedical research activities globally. By end-user, the market is segmented into academic medical centers, hospitals and clinics, research laboratories, and pharmaceutical and biotechnology companies. Research laboratories are estimated to dominate the global medical holography market over the forecast time period. By region, North America is anticipated to lead the global medical holography market over the forecast time period. This can be attributed to the high research and development activities and robust healthcare systems in North America, especially in the U.S. The Asia Pacific region is expected to be the fastest growing region in the medical holography market globally in the future. The Middle East and Africa and Latin America are expected to show considerable growth in the market for medical holography in the years ahead. Some key players of the global medical holography market are Phase Holographic Imaging AB, Nanolive SA, Holoxica Limited, Echopixel, EON Reality, Inc., Zebra Imaging, RealView Imaging Ltd., Lyncee Tec., Mach7 Technologies Limited, and zSpace, Inc., among others.